This article is about the form of government. For other uses, see Federalism (disambiguation). Federalism is the mixed or compound mode of government, combining a general government (the central or 'federal' government) with regional governments (provincial, state, cantonal, territorial or other sub-unit governments) in a single political system. Its distinctive feature, exemplified in the founding example of modern federalism by the United States under the Constitution of 1787, is a relationship of parity between the two levels of government established. It can thus be defined as a form of government in which there is a division of powers between two levels of government of equal status. Federalism differs from confederalism, in which the general level of government is subordinate to the regional level, and from devolution within a unitary state, in which the regional level of government is subordinate to the general level. It represents the central form in the pathway of regional integration or separation, bounded on the less integrated side by confederalism and on the more integrated side by devolution within a unitary state. Leading examples of the federation or federal state include India, the United States, Brazil, Mexico, Russia, Germany, Canada, Switzerland, Argentina, and Australia. Some also today characterize the European Union as the pioneering example of federalism in a multi-state setting, in a concept termed the federal union of states. The terms 'federalism' and 'confederalism' both have a root in the Latin word foedus, meaning "treaty, pact or covenant." Their common meaning until the late eighteenth century was a simple league or inter-governmental relationship among sovereign states based upon a treaty. They were therefore initially synonyms. It was in this sense that James Madison in Federalist 39 had referred to the new US Constitution as 'neither a national nor a federal Constitution, but a composition of both' (i.e. neither constituting a single large unitary state nor a league/confederation among several small states, but a hybrid of the two). In the course of the nineteenth century the meaning of federalism would come to shift, strengthening to refer uniquely to the novel compound political form established, while the meaning of confederalism would remain at a league of states. Thus, this article relates to the modern usage of the word 'federalism'. Modern federalism is a system based upon democratic rules and institutions in which the power to govern is shared between national and provincial/state governments. The term federalist describes several political beliefs around the world depending on context. Federalism is sometimes viewed as in the context of international negotiation as "the best system for integrating diverse nations, ethnic groups, or combatant parties, all of whom may have cause to fear control by an overly powerful center." However, in some countries, those skeptical of federal prescriptions believe that increased regional autonomy is likely to lead to secession or dissolution of the nation. In Syria, federalization proposals have failed in part because "Syrians fear that these borders could turn out to be the same as the ones that the fighting parties have currently carved out." Federations such as Yugoslavia or Czechoslovakia collapsed as soon as it was possible to put the model to the test. Ideational theories, which hold that a greater degree of ideological commitment to decentralist ideas in society makes federalism more likely to be adopted. Cultural-historical theories, which hold that federal institutions are more likely to be adopted in societies with culturally or ethnically fragmented populations. "Social contract" theories, which hold that federalism emerges as a bargain between a center and a periphery where the center is not powerful enough to dominate the periphery and the periphery is not powerful enough to secede from the center. "Infrastructural power" theories, which hold that federalism is likely to emerge when the subunits of a potential federation already have highly developed infrastructures (e.g. they are already constitutional, parliamentary, and administratively modernized states). Immanuel Kant was an advocate of federalism, noting that "the problem of setting up a state can be solved even by a nation of devils" so long as they possess an appropriate constitution which pits opposing factions against each other with a system of checks and balances. In particular individual states required a federation as a safeguard against the possibility of war. 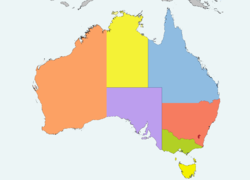 Commonwealth of Australia, consisting of its federal district, Australian Capital Territory (red), the states of New South Wales (pink), Queensland (blue), South Australia (purple), Tasmania (yellow, bottom), Victoria (green), Western Australia (orange) and the Northern Territory (yellow, top). On the 1st of January 1901 the nation-state of Australia officially came into existence as a federation. The Australian continent was colonised by the United Kingdom in 1788, which subsequently established six, eventually self-governing, colonies there. In the 1890s the governments of these colonies all held referendums on becoming the unified, self-governing "Commonwealth of Australia" within the British Empire. When all the colonies voted in favour of federation, the Federation of Australia commenced, resulting in the establishment of the Commonwealth of Australia in 1901. The model of Australian federalism adheres closely to the original model of the United States of America, although it does so through a parliamentary Westminster system rather than a presidential system. Brazil is a union of 26 states and its federal district, which is the site of the federal capital, Brasília. In Brazil, the fall of the monarchy in 1889 by a military coup d'état led to the rise of the presidential system, headed by Deodoro da Fonseca. Aided by well-known jurist Ruy Barbosa, Fonseca established federalism in Brazil by decree, but this system of government would be confirmed by every Brazilian constitution since 1891, although some of them would distort some of the federalist principles. The 1937 federal government had the authority to appoint State Governors (called intervenors) at will, thus centralizing power in the hands of President Getúlio Vargas. Brazil also uses the Fonseca system to regulate interstate trade. Brazil is one of the biggest federal governments. In Canada, the provincial governments derive all their powers directly from the constitution. In contrast, the territories are subordinate to the federal government and are delegated powers by it. In Canada the system of federalism is described by the division of powers between the federal parliament and the country's provincial governments. Under the Constitution Act (previously known as the British North America Act) of 1867, specific powers of legislation are allotted. Section 91 of the constitution gives rise to federal authority for legislation, whereas section 92 gives rise to provincial powers. For matters not directly dealt with in the constitution, the federal government retains residual powers; however, conflict between the two levels of government, relating to which level has legislative jurisdiction over various matters, has been a longstanding and evolving issue. Areas of contest include legislation with respect to regulation of the economy, taxation, and natural resources. The Government of India (referred to as the Union Government) was established by the Constitution of India, and is the governing authority of a federal union of 29 states and 7 union territories. Union List includes subjects of national importance such as defence of the country, foreign affairs, banking, communications and currency. The Union Government alone can make laws relating to the subjects mentioned in the Union List. State List contains subjects of State and local importance such as police, trade, commerce, agriculture and irrigation. The State Governments alone can make laws relating to the subjects mentioned in the State List. Concurrent List includes subjects of common interest to both the Union Government as well as the State Governments, such as education, forest, trade unions, marriage, adoption and succession. Both the Union as well as the State Governments can make laws on the subjects mentioned in this list. If their laws conflict with each other, the law made by the Union Government will prevail. A distinguishing aspect of Indian federalism is that unlike many other forms of federalism, it is asymmetric. Article 370 makes special provisions for the state of Jammu and Kashmir as per its Instrument of Accession. Article 371 makes special provisions for the states of Andhra Pradesh, Arunachal Pradesh, Assam, Goa, Gujarat, Karnataka, Maharashtra, Manipur, Mizoram, Nagaland and Sikkim as per their accession or state-hood deals. Also one more aspect of Indian federalism is system of President's Rule in which the central government (through its appointed Governor) takes control of state's administration for certain months when no party can form a government in the state or there is violent disturbance in the state. The Federal Republic of Nigeria has various states which have evolved over time due to complex socioeconomic issues as well as the effect of their colonial era. 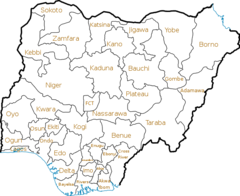 However, in modern Nigeria there are thirty six states and one federal capital territory: Abia, Adamawa, Akwa Ibom, Anambra, Bauchi, Bayelsa, Benue, Borno, Cross River, Delta, Ebonyi, Enugu, Edo, Ekiti, Gombe, Imo, Jigawa, Kaduna, Kano, Katsina, Kebbi, Kogi, Kwara, Lagos, Nasarawa, Niger, Ogun, Ondo, Osun, Oyo, Plateau, Rivers, Sokoto, Taraba, Yobe, and Zamfara, and the Federal Capital Territory (FCT). There has been significant tension between the southern states and the northern states due to financial inequality, ethnic differences, religious conflict, and more. For example, religious conflict has led to the rise of Boko Haram, a violent Islamist militant group which practices salafi jihadism and wahhabism. In recent times, the Nigerian government has often been accused of being a northern-dominated government that seeks to exploit the south and benefit the north to the detriment of the south. Malaysia is a federal constitutional monarchy. 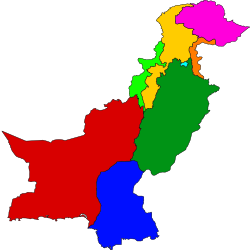 The Islamic Republic of Pakistan, consisting of its federal district, Islamabad Capital Territory (light blue), the provinces of the Punjab (dark green), Sindh (dark blue), Balochistan (red), Khyber Pakhtunkhwa (yellow), and the territories of Gilgit-Baltistan (pink) and Azad Kashmir (orange). The former Federally Administered Tribal Areas, now part of Khyber Pakhtunkhwa, are shown in light green. Pakistan is a democratic parliamentary federal republic, with Islam as the state religion. Powers are shared between the federal government and the provinces. Relations between federation and provinces is defined in Part V(Articles 141-159) of the constitution. Pakistan consists of four provinces and three territories, including the Islamabad Capital Territory. The District Coordination Officer is the administrative head of the District Administration. They have wide-ranging responsibility for overseeing, improving and directing the approved plans of the District Government. The Zila Nazim used to be the executive head of the District Administration until 2010 when the government gave their powers to the District Coordination Officers also. Their role is similar to district governor or prefect, with responsibility for implementing government strategy and developing initiatives arising out of it. In order to decentralize administrative and financial authority to be accountable to Local Governments, for good governance, effective delivery of services and transparent decision making through institutionalized participation of the people at grassroots level, elections to the local government institutions are held after every four years on none party basis by the Chief Election Commissioner of Pakistan. Among the three tiers of local government, Tesil government is second tier of it. It is where the functions, responsibilities and authorities of districts government is divided into more smaller units, these units are known as "Tehsil". The Tehsils are used in all over the Pakistan except Sindh province where the word "Taluka" is used instead, although the functions and authorities are same. The head of the Tehsil government is "Tehsil Nazim" who is assisted by the tehsil Naib-Nazim. Every tehsil has a Tehsil Municipal Administration, consisting of a Tehsil council, Tehsil Nazim, tehsil/taluka municipal officer(TMO), Chief officer and other officials of local council. Members of Union Council including Union Administrator and Vice Union Administrator are elected through direct elections based on adult franchise and on the basis of joint electorate. However, for the election to the reserved seats for Women in Zila Council proportionately divided among Tehsils or Towns shall be all members of the Union Councils in a Tehsil or Town. It is the responsibility of the Chief Election Commissioner to organize and conduct these elections. Several federal systems exist in Europe, such as in Switzerland, Austria, Germany, Belgium, Bosnia and Herzegovina and the European Union. In Britain, an Imperial Federation was once seen as (inter alia) a method of solving the Home Rule problem in Ireland; federalism has long been proposed[by whom?] as a solution to the "Irish Problem", and more lately, to the "West Lothian question". During the French Revolution, especially in 1793, "federalism" had an entirely different meaning. It was a political movement to weaken the central government in Paris by devolving power to the provinces. Following the end of World War II, several movements began advocating a European federation, such as the Union of European Federalists and the European Movement, founded in 1948. Those organizations exercised influence in the European unification process, but never in a decisive way. Although the drafts of both the Maastricht treaty and the Treaty establishing a Constitution for Europe mentioned federalism, the reference never made it to the text of the treaties adopted by consensus. The strongest advocates of European federalism have been Germany, Italy, Belgium and Luxembourg while those historically most strongly opposed have been the United Kingdom, Denmark and France (with conservative heads of state and governments). Since the presidency of François Mitterrand (1981-1995), the French authorities have adopted a much more pro-European Unification position, as they consider that a strong EU is presenting the best "insurance" against a unified Germany which might become too strong and thus a threat for its neighbours. Germany and the EU present the only examples of federalism in the world where members of the federal "upper houses" (the German Bundesrat (Federal Council) and the European Council) are neither elected nor appointed but comprise members or delegates of the governments of their constituents. The United States had a similar system until 1913, where prior to the 17th Amendment, Senators were delegates of the state elected by the state legislatures rather than the citizens. 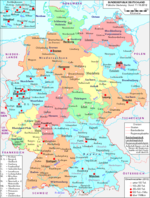 Accordingly, the idea of a strong, centralized government has very negative connotations in German politics, although the progressive political movements in Germany (Liberals, Social Democrats) were advocating at the time of the Second German Empire (1871-1918) to abolish (or to reshape) the majority of German federated states of that era, as they were considered to be mostly monarchist remnances of the feudal structures of the Middle Ages. 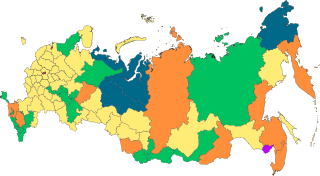 The post-Imperial nature of Russian subdivision of government changed towards a generally autonomous model which began with the establishment of the USSR (of which Russia was governed as part). It was liberalized in the aftermath of the Soviet Union, with the reforms under Boris Yeltsin preserving much of the Soviet structure while applying increasingly liberal reforms to the governance of the constituent republics and subjects (while also coming into conflict with Chechen secessionist rebels during the Chechen War). Some of the reforms under Yeltsin were scaled back by Vladimir Putin. All of Russia's subdivisional entities are known as subjects, with some smaller entities, such as the republics enjoying more autonomy than other subjects on account of having an extant presence of a culturally non-Russian ethnic minority or, in some cases, majority. Currently, there are 85 federal subjects of Russia. The UAE is a federal absolute monarchy of the six ruling families of the United Arab Emirates with Emir of each Emirate being an absolute monarch and the Emir of Abu Dhabi being also the President of the UAE. 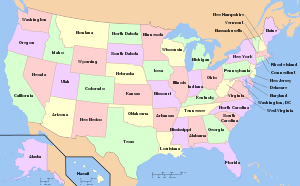 The United States is composed of fifty self-governing states and several territories. Because the states were preexisting political entities, the U.S. Constitution did not need to define or explain federalism in any one section but it often mentions the rights and responsibilities of state governments and state officials in relation to the federal government. The federal government has certain express powers (also called enumerated powers) which are powers spelled out in the Constitution, including the right to levy taxes, declare war, and regulate interstate and foreign commerce. In addition, the Necessary and Proper Clause gives the federal government the implied power to pass any law "necessary and proper" for the execution of its express powers. Other powers—the reserved powers—are reserved to the people or the states. The power delegated to the federal government was significantly expanded by the Supreme Court decision in McCulloch v. Maryland (1819), amendments to the Constitution following the Civil War, and by some later amendments—as well as the overall claim of the Civil War, that the states were legally subject to the final dictates of the federal government. The Federalist Party of the United States was opposed by the Democratic-Republicans, including powerful figures such as Thomas Jefferson. The Democratic-Republicans mainly believed that: the Legislature had too much power (mainly because of the Necessary and Proper Clause) and that they were unchecked; the Executive had too much power, and that there was no check on the executive; a dictator would arise; and that a bill of rights should be coupled with the constitution to prevent a potential dictator from exploiting or tyrannizing citizens. The federalists, on the other hand, argued that it was impossible to list all the rights, and those that were not listed could be easily overlooked because they were not in the official bill of rights. Rather, rights in specific cases were to be decided by the judicial system of courts. After the American Civil War, the federal government increased greatly in influence on everyday life and in size relative to the state governments. Reasons included the need to regulate businesses and industries that span state borders, attempts to secure civil rights, and the provision of social services. The federal government acquired no substantial new powers until the acceptance by the Supreme Court of the Sherman Anti-Trust Act. From 1938 until 1995, the U.S. Supreme Court did not invalidate any federal statute as exceeding Congress' power under the Commerce Clause. Most actions by the federal government can find some legal support among the express powers, such as the Commerce Clause, whose applicability has been narrowed by the Supreme Court in recent years. In 1995 the Supreme Court rejected the Gun-Free School Zones Act in the Lopez decision, and also rejected the civil remedy portion of the Violence Against Women Act of 1994 in the United States v. Morrison decision. Recently, the Commerce Clause was interpreted to include marijuana laws in the Gonzales v. Raich decision. Dual federalism holds that the federal government and the state governments are co-equals, each sovereign. However, since the Civil War Era, the national courts often interpret the federal government as the final judge of its own powers under dual federalism. The establishment of Native American governments (which are separate and distinct from state and federal government) exercising limited powers of sovereignty, has given rise to the concept of "bi-federalism." The Federal War ended in 1863 with the signing of the Treaty of Coche by both the centralist government of the time and the Federal Forces. The United States of Venezuela were subsequently incorporated under a "Federation of Sovereign States" upon principles borrowed from the Articles of Confederation of the United States of America. In this Federation, each State had a "President" of its own that controlled almost every issue, even the creation of "State Armies," while the Federal Army was required to obtain presidential permission to enter any given state. However, more than 140 years later, the original system has gradually evolved into a quasi-centralist form of government. While the 1999 Constitution still defines Venezuela as a Federal Republic, it abolished the Senate, transferred competences of the States to the Federal Government and granted the President of the Republic vast powers to intervene in the States and Municipalities. Federalism in the Kingdom of Belgium is an evolving system. geographically defined Regions (federated States: Brussels-Capital (de facto Greater Brussels), Flanders and Wallonia). The last two correspond to the language areas in Belgium, Wallonia hosting both the bulk of the French-speaking population and the German-speaking minority. In Brussels, ca. 80% of the population speaks French and ca. 20% Dutch with the city being an enclave of the Flemish region and officially a bilingual area. Flanders is the region associated with Belgium's Dutch-speaking majority, i.e. the Flemish Community. Due to its relatively small size (approximately one percent) the German-speaking Community of Belgium does not have much influence on national politics. 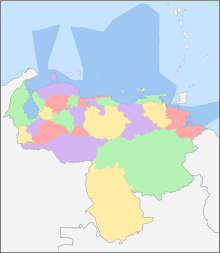 Wallonia is a French-speaking area, except for the German-speaking so-called East Cantons (Cantons de l'est). French is the second most spoken mother tongue of Belgium, after Dutch. Within the French-speaking Community of Belgium, there is a geographical and political distinction between Wallonia and Brussels for historical and sociological reasons. Historically, the Walloons were for a federalism with three components and the Flemings for two. This difference is one of the elements which makes the Belgian issue so complicated. The Flemings wanted to defend their culture while the Walloons wanted to defend their political and economical supremacy they had in the 19th century: It is true that the Walloon movement, which has never stopped affirming that Wallonia is part of the French cultural area, has never made this cultural struggle a priority, being more concerned to struggle against its status as a political minority and the economic decline which was only a corollary to it. On one hand, this means that the Belgian political landscape, generally speaking, consists of only two components: the Dutch-speaking population represented by Dutch-language political parties, and the majority populations of Wallonia and Brussels, represented by their French-speaking parties. The Brussels region emerges as a third component. This specific dual form of federalism, with the special position of Brussels, consequently has a number of political issues—even minor ones—that are being fought out over the Dutch/French-language political division. With such issues, a final decision is possible only in the form of a compromise. This tendency gives this dual federalism model a number of traits that generally are ascribed to confederalism, and makes the future of Belgian federalism contentious. This aspect of Belgian federalism helps to explain the difficulties of partition; Brussels, with its importance, is linked to both Wallonia and Flanders and vice versa. This situation, however, does not erase the traits of a confederation in the Belgian system. Bosnia and Herzegovina is a federation of two entities: Republika Srpska and Federation of Bosnia and Herzegovina (the latter itself a federation). Czechoslovakia, until the Czech Republic and the Slovak Republic separated in 1993. The Federal Republic of Yugoslavia, from 1992 to 2003 when it became a confederation titled the State Union of Serbia and Montenegro. This confederation expired 2006 as Montenegro declared its independence. The 1960 Constitution of Cyprus was based on the same ideas, but the union of Greeks and Turks failed. United Republic of Tanzania (formerly United Republic of Tanganyika and Zanzibar), which was the union of Tanganyika and Zanzibar. Iraq adapted a federal system on 15 October 2005, and formally recognized the Kurdistan Region as the country's first and currently only federal region. See Constitution of Iraq for more information regarding Iraq's method of creating federal entities. It has been proposed in several unitary states to establish a federal system, for various reasons. China is the largest unitary state in the world by both population and land area. Although China has had long periods of central rule for centuries, it is often argued that the unitary structure of the Chinese government is far too unwieldy to effectively and equitably manage the country's affairs. On the other hand, Chinese nationalists are suspicious of decentralization as a form of secessionism and a backdoor for national disunity; still others argue that the degree of autonomy given to provincial-level officials in the People's Republic of China amounts to a de facto federalism. Shortly after the 2011 civil war, some people in Cyrenaica (in the eastern region of the country) began to call for the new regime to be federal, with the traditional three regions of Libya (Cyrenaica, Tripolitania, and Fezzan) being the constituent units. A group calling itself the "Cyrenaican Transitional Council" issued a declaration of autonomy on 6 March 2012; this move was rejected by the National Transitional Council in Tripoli. The changes in the state structure that composes the national government in Naypyitaw and the state/regional governments and the federal negotiations between the national government and ethnic minority armed forces said to be the first step of federalism in Myanmar. Former president of Myanmar, Thein Sein supported the federalization of Myanmar as he said federalization can promote national stability. The Philippines is a unitary state with some powers devolved to Local Government Units (LGUs) under the terms of the Local Government Code. 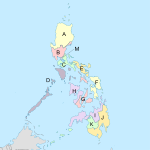 There is also one autonomous region, the Autonomous Region in Muslim Mindanao. Over the years various modifications have been proposed to the Constitution of the Philippines, including possible transition to a federal system as part of a shift to a semi-presidential system. In 2004, Philippine President Gloria Macapagal Arroyo established the Consultative Commission which suggested such a Charter Change but no action was taken by the Philippine Congress to amend the 1987 Constitution. The push for federalism was again revived under the administration of Rodrigo Duterte in 2016. Spain is a unitary state with a high level of decentralisation, often regarded as a federal system in all but name or a "federation without federalism". The country has been quoted as being "an extraordinarily decentralized country", with the central government accounting for just 18% of public spending, 38% for the regional governments, 13% for the local councils, and the remaining 31% for the social security system. The current Spanish constitution has been implemented in such a way that, in many respects, Spain can be compared to countries which are undeniably federal. However, in order to manage the tensions present in the Spanish transition to democracy, the drafters of the current Spanish constitution avoided giving labels such as 'federal' to the territorial arrangements. Besides, unlike in the federal system, the main taxes are taken centrally from Madrid (except for the Basque Country and Navarre, which were recognized in the Spanish democratic constitution as charter territories drawing from historical reasons) and then distributed to the Autonomous Communities. An explicit and legal recognition of federalism as such has been promoted by parties such as Podemos, United Left and the Spanish Socialist Workers' Party. The Spanish Socialist party considered the idea of enshrining a federal Spain in 2012, as meeting point between separatist and recentralizing proposals. Federalism has long been advocated as a means of resolving the ethnic issues and unbalanced development in Sri Lanka. As the unitary state has resulted in uneven development across Sri Lanka the Western Province dominates over the other 8 provinces. Despite declining regional disparity Western province continues to contribute most to the Gross Domestic Product(GDP) contributing 42% of the GDP while the second highest the Southern Province only represents 10.8% of the GDP while Uva and Northern provinces representing the least with 5% and 3.6% respectively. Other provinces also have trouble attracting capitals. This has resulted in calls for the abolishing of the unitary system and powers being devolved. The federalization of Syria has been proposed as a way to end the Syrian Civil War. In the broadest sense, it means turning the centralized Syrian Arab Republic into a federal republic with autonomous subdivisions. Many powers and actors involved in the Syrian Civil War have entertained the idea of "federal division", not least among them Russia, United Nations representatives, and the United States. President Bashar al-Assad has not ruled out the possibility of a federal democratic state of Syria. In particular, Turkey is strongly hostile towards the idea of a federalization of Syria because it fears possible repercussions for its own highly centralized state. Due to the fact that federalization would more or less follow ethnic and possibly also religious-sectarian lines, it has been dismissed as "division of the country" and "Balkanization" by its opponents. Mainstream institutions of the Syrian opposition based in Turkey or Qatar like the Syrian National Council and the National Coalition for Syrian Revolutionary and Opposition Forces have consistently rejected the idea of federalization, while in particular Kurds in Syria have promoted the idea. The Egypt-based opposition party Syria's Tomorrow Movement takes an intermediate position. The United Kingdom has traditionally been governed as a unitary state by the Westminster Parliament in London. Instead of adopting a federal model, the UK has relied on gradual devolution to decentralise political power. Devolution in the UK began with the Government of Ireland Act 1914 which granted home rule to Ireland as a constituent country of the former United Kingdom of Great Britain and Ireland. Following the partition of Ireland in 1921 which saw the creation of the sovereign Irish Free State (which eventually evolved into the modern day Republic of Ireland), Northern Ireland retained its devolved government through the Parliament of Northern Ireland, the only part of the UK to have such a body at this time. This body was suspended in 1972 and Northern Ireland was governed by direct rule during the period of conflict known as The Troubles. In modern times, a process of devolution in the United Kingdom has decentralised power once again. Since the 1997 referendums in Scotland and Wales and the Good Friday Agreement in Northern Ireland, three of the four constituent countries of the UK now have some level of autonomy. Government has been devolved to the Scottish Parliament, the National Assembly for Wales and the Northern Ireland Assembly. England does not have its own parliament and English affairs continue to be decided by the Westminster Parliament. In 1998 a set of eight unelected Regional assemblies, or chambers, was created to support the English Regional Development Agencies, but these were abolished between 2008 and 2010. The Regions of England continue to be used in certain governmental administrative functions. Critics of devolution often cite the West Lothian question, which refers to the voting power of non-English MPs on matters affecting only England in the UK Parliament. Scottish and Welsh nationalism have been increasing in popularity, and since the Scottish independence referendum, 2014 there has been a wider debate about the UK adopting a federal system with each of the four home nations having its own, equal devolved legislatures and law-making powers. UK federal government was proposed as early as 1912 by the Member of Parliament for Dundee, Winston Churchill, in the context of the legislation for Irish Home Rule. In a speech in Dundee on 12 September, he proposed that England should also be governed by regional parliaments, with power devolved to areas such as Lancashire, Yorkshire, the Midlands and London as part of a federal system of government. In Europe, "Federalist" is sometimes used to describe those who favor a common federal government, with distributed power at regional, national and supranational levels. Most European federalists want this development to continue within the European Union. European federalism originated in post-war Europe; one of the more important initiatives was Winston Churchill's speech in Zürich in 1946. In the United States, federalism originally referred to belief in a stronger central government. When the U.S. Constitution was being drafted, the Federalist Party supported a stronger central government, while "Anti-Federalists" wanted a weaker central government. This is very different from the modern usage of "federalism" in Europe and the United States. The distinction stems from the fact that "federalism" is situated in the middle of the political spectrum between a confederacy and a unitary state. The U.S. Constitution was written as a reaction to the Articles of Confederation, under which the United States was a loose confederation with a weak central government. In contrast, Europe has a greater history of unitary states than North America, thus European "federalism" argues for a weaker central government, relative to a unitary state. The modern American usage of the word is much closer to the European sense. As the power of the Federal government has increased, some people[who?] have perceived a much more unitary state than they believe the Founding Fathers intended. Most people politically advocating "federalism" in the United States argue in favor of limiting the powers of the federal government, especially the judiciary (see Federalist Society, New Federalism). In Canada, federalism typically implies opposition to sovereigntist movements (most commonly Quebec separatism). The governments of Argentina, Australia, Brazil, India, and Mexico, among others, are also organized along federalist principles. Federalism may encompass as few as two or three internal divisions, as is the case in Belgium or Bosnia and Herzegovina. In general, two extremes of federalism can be distinguished: at one extreme, the strong federal state is almost completely unitary, with few powers reserved for local governments; while at the other extreme, the national government may be a federal state in name only, being a confederation in actuality. In 1999, the Government of Canada established the Forum of Federations as an international network for exchange of best practices among federal and federalizing countries. Headquartered in Ottawa, the Forum of Federations partner governments include Australia, Brazil, Canada, Ethiopia, Germany, India, Mexico, Nigeria, and Switzerland. "The social and political structure of anarchy is similar to that of the economic structure, i.e., it is based on a voluntary federation of decentralized, directly democratic policy-making bodies. These are the neighborhood and community assemblies and their confederations. In these grassroots political units, the concept of "self-management" becomes that of "self-government", a form of municipal organisation in which people take back control of their living places from the bureaucratic state and the capitalist class whose interests it serves. The key to that change, from the anarchist standpoint, is the creation of a network of participatory communities based on self-government through direct, face-to-face democracy in grassroots neighborhood and community assemblies [meetings for discussion, debate, and decision making]. Since not all issues are local, the neighborhood and community assemblies will also elect mandated and re-callable delegates to the larger-scale units of self-government in order to address issues affecting larger areas, such as urban districts, the city or town as a whole, the county, the bio-region, and ultimately the entire planet. Thus the assemblies will confederate at several levels in order to develop and co-ordinate common policies to deal with common problems. This need for co-operation does not imply a centralized body. To exercise your autonomy by joining self-managing organisations and, therefore, agreeing to abide by the decisions you help make is not a denial of that autonomy (unlike joining a hierarchical structure, where you forsake autonomy within the organisation). In a centralized system, we must stress, power rests at the top and the role of those below is simply to obey (it matters not if those with the power are elected or not, the principle is the same). In a federal system, power is not delegated into the hands of a few (obviously a "federal" government or state is a centralized system). Decisions in a federal system are made at the base of the organisation and flow upwards so ensuring that power remains decentralized in the hands of all. Working together to solve common problems and organize common efforts to reach common goals is not centralization and those who confuse the two make a serious error -- they fail to understand the different relations of authority each generates and confuse obedience with co-operation." Federalism also finds expression in ecclesiology (the doctrine of the church). For example, presbyterian church governance resembles parliamentary republicanism (a form of political federalism) to a large extent. In Presbyterian denominations, the local church is ruled by elected elders, some of which are ministerial. Each church then sends representatives or commissioners to presbyteries and further to a general assembly. Each greater level of assembly has ruling authority over its constituent members. In this governmental structure, each component has some level of sovereignty over itself. As in political federalism, in presbyterian ecclesiology there is shared sovereignty. Other ecclesiologies also have significant representational and federalistic components, including the more anarchic congregational ecclesiology, and even in more hierarchical episcopal ecclesiology. Some Christians argue that the earliest source of political federalism (or federalism in human institutions; in contrast to theological federalism) is the ecclesiastical federalism found in the Bible. They point to the structure of the early Christian Church as described (and prescribed, as believed by many) in the New Testament. In their arguments, this is particularly demonstrated in the Council of Jerusalem, described in Acts chapter 15, where the Apostles and elders gathered together to govern the Church; the Apostles being representatives of the universal Church, and elders being such for the local church. To this day, elements of federalism can be found in almost every Christian denomination, some more than others. Not to be confused with separation of powers. In a federation, the division of power between federal and regional governments is usually outlined in the constitution. Almost every country allows some degree of regional self-government, in federations the right to self-government of the component states is constitutionally entrenched. Component states often also possess their own constitutions which they may amend as they see fit, although in the event of conflict the federal constitution usually takes precedence. In almost all federations the central government enjoys the powers of foreign policy and national defense as exclusive federal powers. Were this not the case a federation would not be a single sovereign state, per the UN definition. Notably, the states of Germany retain the right to act on their own behalf at an international level, a condition originally granted in exchange for the Kingdom of Bavaria's agreement to join the German Empire in 1871. Beyond this the precise division of power varies from one nation to another. The constitutions of Germany and the United States provide that all powers not specifically granted to the federal government are retained by the states. The Constitution of some countries like Canada and India, on the other hand, state that powers not explicitly granted to the provincial governments are retained by the federal government. Much like the US system, the Australian Constitution allocates to the Federal government (the Commonwealth of Australia) the power to make laws about certain specified matters which were considered too difficult for the States to manage, so that the States retain all other areas of responsibility. Under the division of powers of the European Union in the Lisbon Treaty, powers which are not either exclusively of European competence or shared between EU and state as concurrent powers are retained by the constituent states. Where every component state of a federation possesses the same powers, we are said to find 'symmetric federalism'. Asymmetric federalism exists where states are granted different powers, or some possess greater autonomy than others do. This is often done in recognition of the existence of a distinct culture in a particular region or regions. In Spain, the Basques and Catalans, as well as the Galicians, spearheaded a historic movement to have their national specificity recognized, crystallizing in the "historical communities" such as Navarre, Galicia, Catalonia, and the Basque Country. They have more powers than the later expanded arrangement for other Spanish regions, or the Spain of the autonomous communities (called also the "coffee for everyone" arrangement), partly to deal with their separate identity and to appease peripheral nationalist leanings, partly out of respect to specific rights they had held earlier in history. However, strictly speaking Spain is not a federalism, but a decentralized administrative organization of the state. It is common that during the historical evolution of a federation there is a gradual movement of power from the component states to the centre, as the federal government acquires additional powers, sometimes to deal with unforeseen circumstances. The acquisition of new powers by a federal government may occur through formal constitutional amendment or simply through a broadening of the interpretation of a government's existing constitutional powers given by the courts. Usually, a federation is formed at two levels: the central government and the regions (states, provinces, territories), and little to nothing is said about second or third level administrative political entities. 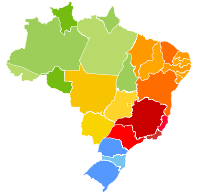 Brazil is an exception, because the 1988 Constitution included the municipalities as autonomous political entities making the federation tripartite, encompassing the Union, the States, and the municipalities. Each state is divided into municipalities (municípios) with their own legislative council (câmara de vereadores) and a mayor (prefeito), which are partly autonomous from both Federal and State Government. Each municipality has a "little constitution", called "organic law" (lei orgânica). Mexico is an intermediate case, in that municipalities are granted full-autonomy by the federal constitution and their existence as autonomous entities (municipio libre, "free municipality") is established by the federal government and cannot be revoked by the states' constitutions. Moreover, the federal constitution determines which powers and competencies belong exclusively to the municipalities and not to the constituent states. However, municipalities do not have an elected legislative assembly. Federations often employ the paradox of being a union of states, while still being states (or having aspects of statehood) in themselves. For example, James Madison (author of the US Constitution) wrote in Federalist Paper No. 39 that the US Constitution "is in strictness neither a national nor a federal constitution; but a composition of both. In its foundation, it is federal, not national; in the sources from which the ordinary powers of the Government are drawn, it is partly federal, and partly national..." This stems from the fact that states in the US maintain all sovereignty that they do not yield to the federation by their own consent. This was reaffirmed by the Tenth Amendment to the United States Constitution, which reserves all powers and rights that are not delegated to the Federal Government as left to the States and to the people. The structures of most federal governments incorporate mechanisms to protect the rights of component states. One method, known as 'intrastate federalism', is to directly represent the governments of component states in federal political institutions. Where a federation has a bicameral legislature the upper house is often used to represent the component states while the lower house represents the people of the nation as a whole. A federal upper house may be based on a special scheme of apportionment, as is the case in the senates of the United States and Australia, where each state is represented by an equal number of senators irrespective of the size of its population. Alternatively, or in addition to this practice, the members of an upper house may be indirectly elected by the government or legislature of the component states, as occurred in the United States prior to 1913, or be actual members or delegates of the state governments, as, for example, is the case in the German Bundesrat and in the Council of the European Union. The lower house of a federal legislature is usually directly elected, with apportionment in proportion to population, although states may sometimes still be guaranteed a certain minimum number of seats. In Canada, the provincial governments represent regional interests and negotiate directly with the central government. A First Ministers conference of the prime minister and the provincial premiers is the de facto highest political forum in the land, although it is not mentioned in the constitution. Federations often have special procedures for amendment of the federal constitution. As well as reflecting the federal structure of the state this may guarantee that the self-governing status of the component states cannot be abolished without their consent. An amendment to the constitution of the United States must be ratified by three-quarters of either the state legislatures, or of constitutional conventions specially elected in each of the states, before it can come into effect. In referendums to amend the constitutions of Australia and Switzerland it is required that a proposal be endorsed not just by an overall majority of the electorate in the nation as a whole, but also by separate majorities in each of a majority of the states or cantons. In Australia, this latter requirement is known as a double majority. Some federal constitutions also provide that certain constitutional amendments cannot occur without the unanimous consent of all states or of a particular state. The US constitution provides that no state may be deprived of equal representation in the senate without its consent. In Australia, if a proposed amendment will specifically impact one or more states, then it must be endorsed in the referendum held in each of those states. Any amendment to the Canadian constitution that would modify the role of the monarchy would require unanimous consent of the provinces. The German Basic Law provides that no amendment is admissible at all that would abolish the federal system. Fiscal federalism – the relative financial positions and the financial relations between the levels of government in a federal system. Formal federalism (or 'constitutional federalism') – the delineation of powers is specified in a written constitution, which may or may not correspond to the actual operation of the system in practice. Executive federalism refers in the English-speaking tradition to the intergovernmental relationships between the executive branches of the levels of government in a federal system and in the continental European tradition to the way constituent units 'execute' or administer laws made centrally. Gleichschaltung - the conversion from a federal governance to either a completely unitary or more unitary one, the term was borrowed from the German for conversion from alternating to direct current. During the Nazi era the traditional German states were mostly left intact in the formal sense, but their constitutional rights and sovereignty were eroded and ultimately ended and replaced with the Gau system. Gleichschaltung also has a broader sense referring to political consolidation in general. The meaning of federalism, as a political movement, and of what constitutes a 'federalist', varies with country and historical context. Movements associated with the establishment or development of federations can exhibit either centralising or decentralising trends. For example, at the time those nations were being established, factions known as "federalists" in the United States and Australia advocated the formation of strong central government. Similarly, in European Union politics, federalists mostly seek greater EU integration. In contrast, in Spain and in post-war Germany, federal movements have sought decentralisation: the transfer of power from central authorities to local units. In Canada, where Quebec separatism has been a political force for several decades, the "federalist" impulse aims to keep Quebec inside Canada. Federalism, and other forms of territorial autonomy, is generally seen[by whom?] as a useful way to structure political systems in order to prevent violence among different groups within countries because it allows certain groups to legislate at the subnational level. Some scholars have suggested, however, that federalism can divide countries and result in state collapse because it creates proto-states. Still others have shown that federalism is only divisive when it lacks mechanisms that encourage political parties to compete across regional boundaries. ^ In 1946, scholar Kenneth Wheare observed that the two levels of government in the US were 'co-equally supreme'. In this he echoed the perspective of the founding fathers, James Madison in Federalist 39 having seen the several states as forming 'distinct and independent portions of the supremacy' in relation to the general government. Wheare, Kenneth (1946) Federal Government, Oxford University Press, London, pp. 10-15. Madison, James, Hamilton, Alexander and Jay, John (1987) The Federalist Papers, Penguin, Harmondsworth, p. 258. ^ Wheare, Kenneth (1946), pp. 31-2. ^ Diamond, Martin (1961) "The Federalist's View of Federalism", in Benson, George (ed.) Essays in Federalism, Institute for Studies in Federalism, Claremont, p. 22. Downs, William (2011) 'Comparative Federalism, Confederalism, Unitary Systems', in Ishiyama, John and Breuning, Marijke (eds) Twenty-first Century Political Science: A Reference Handbook, Sage, Los Angeles, Vol. I, pp. 168-9. Hueglin, Thomas and Fenna, Alan (2006) Comparative Federalism: A Systematic Inquiry, Broadview, Peterborough, p. 31. This author identifies two distinct federal forms, where before only one was known, based upon whether sovereignty (conceived in its core meaning of ultimate authority) resides in the whole (in one people) or in the parts (in many peoples). This is determined by the absence or presence of a right of secession for the parts. The structures are termed, respectively, the federal state (or federation) and the federal union of states (or federal union). ^ Madison, James, Hamilton, Alexander and Jay, John (1987) The Federalist Papers, Penguin, Harmondsworth, p. 259. ^ Law, John (2012) 'Sense on Federalism', in Political Quarterly, Vol. 83, No. 3, p. 544. ^ a b c d Michael Meyer-Resende, [https://foreignpolicy.com/2016/03/18/why-talk-of-federalism-wont-help-peace-in-syria-assad/ Why Talk of Federalism Won't Help Peace in Syria, Foreign Policy (March 18, 2017). ^ Daniel Ziblatt (2008). Structuring the State: The Formation of Italy and Germany and the Puzzle of Federalism. Princeton University Press. ^ a b Indian Constitution at Work. NCERT. pp. 232, 233. ^ a b "The Constitution of Pakistan Article 1(2)". ^ "The Constitution of Pakistan Article 1(1)". ^ "Chapter 1: "Distribution of Legislative Powers" of Part V: "Relations between Federation and Provinces"". Pakistani.org. Retrieved 2015-04-24. ^ "UK Politics: Talking Politics The West Lothian Question". BBC News. 1 June 1998. ^ Kelemen, R. Daniel (September 2005). "Built to Last? The durability of EU federalism" (PDF). Princeton University. Archived from the original (PDF) on 2013-01-20. Retrieved 2011-11-28. ^ "THE CONSTITUTION OF THE UNITED STATES OF AMERICA With Explanatory Notes". U.S. Department of State's Bureau of International Information Programs. ^ (in Dutch)”Taalgebruik in Brussel en de plaats van het Nederlands. Enkele recente bevindingen”, Rudi Janssens, Brussels Studies, Nummer 13, 7 January 2008 (see page 4). ^ See: Witte, Els & Craeybeckx, Jan. Politieke geschiedenis van België. Antwerpen, SWU, pp. 455, 459-460. ^ "ligne.net/Wallonie_Politique/1995_Destatte_Philippe_Wallonia-Identity.htm Wallonia today - The search for an identity without nationalist mania - (1995)" Check |url= value (help). ^ "Brussels". Encyclopædia Britannica. Archived from the original on 2013-08-12. Retrieved 2008-10-17. ^ "Bruxelles dans l'oeil du cyclone" (in French). France 2. ^ Libre.be, La. "Les Wallons pour un fédéralisme à trois". ^ a b Libre.be, La. "La Région bruxelloise veut négocier". ^ "Eastern Libya declares autonomy". Russia Today. 6 March 2012. Retrieved 6 March 2012. ^ "Eastern Libya declares semiautonomous region". Google News. The Associated Press. 6 March 2012. Retrieved 6 March 2012. ^ "Thousands rally in Libya against autonomy for east". Reuters. 9 March 2012. ^ Thomson Reuters Foundation | News, Information and Connections for Action Archived June 11, 2012, at the Wayback Machine. Trust.org (2012-03-06). Retrieved on 2013-07-12. ^ "Opinion - Federalism and State Formation in Myanmar". The Irrawaddy. 14 February 2018. Retrieved 8 January 2019. ^ Samet, Brandon Tensley, Oren. "The United States of Myanmar?". Retrieved 8 January 2019. ^ El PSOE plantea una reforma de la Constitución para una España federal. El País. ^ Achieving Balanced Regional Development through Devolution. "The Island". www.island.lk. Retrieved 2016-09-17. ^ Lanka, Gamini Gunaratna, Sri Lanka News Paper by LankaPage.com (LLC)- Latest Hot News from Sri. "Sri Lanka : Western Province major contributor to Sri Lanka\'s economic growth despite decline in regional disparity". www.colombopage.com. Retrieved 2016-09-17. 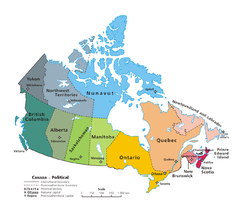 ^ "Provincial Gross Domestic Product – 2014" (PDF). ^ Michael O'Hanlon (3 September 2015). "How will Syria's war end? Other civil wars suggest an answer". Washington Post. ^ a b "Is partitioning Syria a viable option?". Global Risk Insights. ^ a b c d "Syria civil war: Key powers 'consider federal division'". Al Jazeera. March 2016. ^ a b "US, Israel Consider 'Balkanization' of Syria: Coalition Source". Syrian Observer. ^ Zeina Karam And Dan Perry, The Associated Press (29 September 2015). "Partitioning Syria may be the only answer to a devastating civil war with no end in sight". National Post. ^ "Agreement for the future of Syria". ANF. 11 September 2016. Retrieved 11 September 2016. ^ "Unlikely partners join forces to lead by example in Syriaa". Al-Monitor. 30 September 2016. Retrieved 3 October 2016. ^ "Devolution: A beginner's guide". BBC News. 29 April 2010. Retrieved 20 September 2014. ^ Mitchell, James (2011). Devolution in the UK. Manchester University Press. ISBN 9780719053597. ^ Williams, Shirley (16 September 2014). "How Scotland could lead the way towards a federal UK". The Guardian. Retrieved 20 September 2014. ^ "Local Parliaments For England. Mr. Churchill's Outline Of A Federal System, Ten Or Twelve Legislatures". The Times. 13 September 1912. p. 4. ^ "Mr. Winston Churchill's speech at Dundee". The Spectator: 2. 14 September 1912. Retrieved 20 September 2014. ^ "The Churchill Society London. Churchill's Speeches". www.churchill-society-london.org.uk. ^ Page 72 of Koonz, Claudia (2003). The Nazi Conscience. Cambridge, MA: Belknap Press of Harvard University Press. ISBN 978-0-674-01172-4. ^ Arend Lijphart. 1977. Democracy in Plural Societies: A Comparative Exploration. New Haven CT: Yale University Press. ^ Henry E. Hale. Divided We Stand: Institutional Sources of Ethnofederal State Survival and Collapse. World Politics 56(2): 165-193. ^ Dawn Brancati. 2009. Peace by Design: Managing Intrastate Conflict through Decentralization. Oxford: Oxford UP. Look up federalism in Wiktionary, the free dictionary. Wikimedia Commons has media related to Federalism. P.-J. Proudhon, The Principle of Federation, 1863. Teaching about Federalism in the United States - From the Education Resources Information Center Clearinghouse for Social Studies/Social Science Education Bloomington, Indiana.